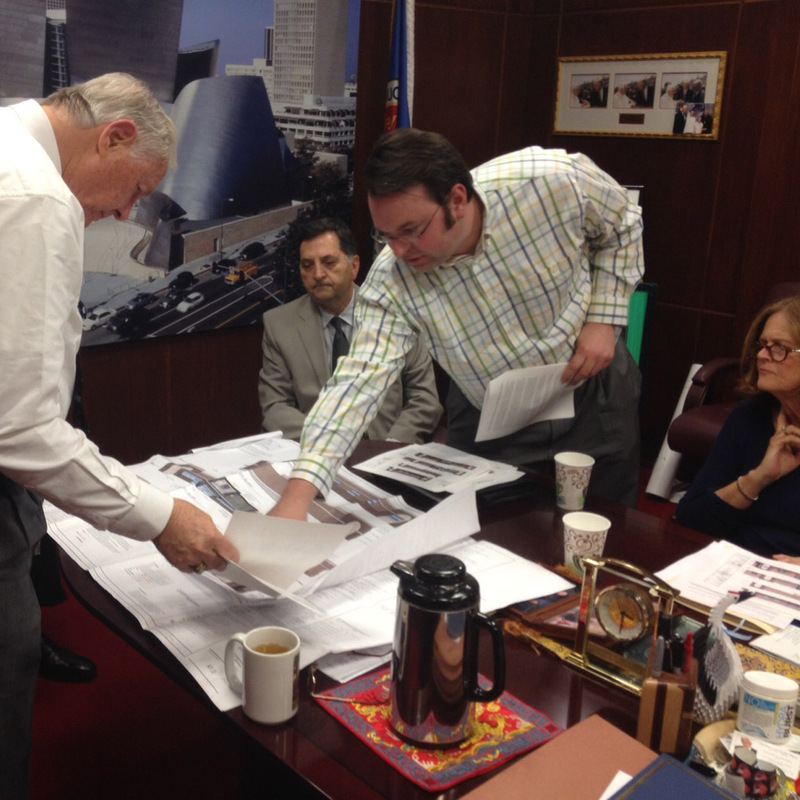 District 5 Supervisor, Mike Antonovich (left) reviews the revised site plan for Lake Avenue/Calaveras with Dan Harlow of the Altadena Chamber of Commerce and CSD committee, Sorin Alexanian with County Regional Planning, and Linda World, AH Chair. On May 26, 2016 Altadena Heritage received notice that the County had issued a “Revocation of Approval for Site Plan” for the Charles Company construction on Lake Avenue and Calaveras Street. This means that construction on the site must stop until the developer answers the County’s questions. The questions begin with the absence of a door on the north end of the Lake Avenue façade – one of several concessions the developer made to the original building plans in response to community pressure. AH has long opposed the proposed construction since the first plans were revealed in Fall 2015. In December, we joined other civic organizations as signatories to the white paper, “Historic Corner: Historic Choices,” drafted by Neighbors Building a Better Altadena (NBBA), which detailed five specific areas where the building plan failed to meet Altadena’s Community Standards District (CSD) guidelines for residential and commercial development. The developer proposed revisions to the plan to address these concerns (such as the door on Lake Avenue) and presented them to the Altadena Town Council (ATC) in January. In February, District 5 Supervisor Mike Antonovich agreed to meet with five representatives of the so-called “White Paper Coalition” to go over the problems, the developer’s revisions to meet the letter of the law, and the need to strengthen the CSD to preclude such construction in the future. AH board chair Linda World attended the meeting and presented a brief statement in support of the white paper. At the time of the meeting, construction was on hold because the developer had failed to get a required permit. When construction resumed, it was soon apparent that the Lake Avenue door was missing. ATC Chair, Diane Marcussen, contacted Antonovich’s office; the end result was the May 26 revocation of approval for the site plan.